AllowSplitLinks now works for Bezier links too. Users can insert a new Bezier segment by dragging any point (other than a control point) of a selected link. 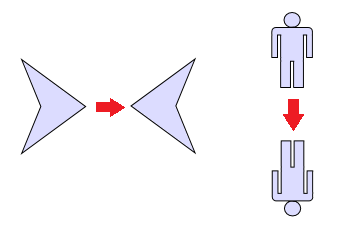 Adjacent segments can be merged back into a single one by dragging a tangent control point (square adjustment handle) onto a pass-through control point (round adjustment handle). IntermediateShape shapes are now rendered at correct position for Spline links. Points where overlapping Cascading links diverge can be marked with shapes specified via LinkBranchIndicator, BranchIndicatorSize and BranchIndicatorColor properties, making it easier to differentiate between branching and crossing segments. The Arrow indicator also shows direction of the link. The control disables Windows touch gestures that interfere with its user interaction code. The Diagram.TouchThreshold property lets you set larger area around adjustment handles where hit is detected, making it easier to modify items on touchscreen without showing visibly large handles. Behavior.PanAndModify lets you select and modify when the mouse pointer is over an item, or pan the view otherwise. CaptionBackBrush property added to ContainerNode lets you customize the fill of container's caption bar. ShapeNotDefined raised for unknown shapes while loading diagram files.